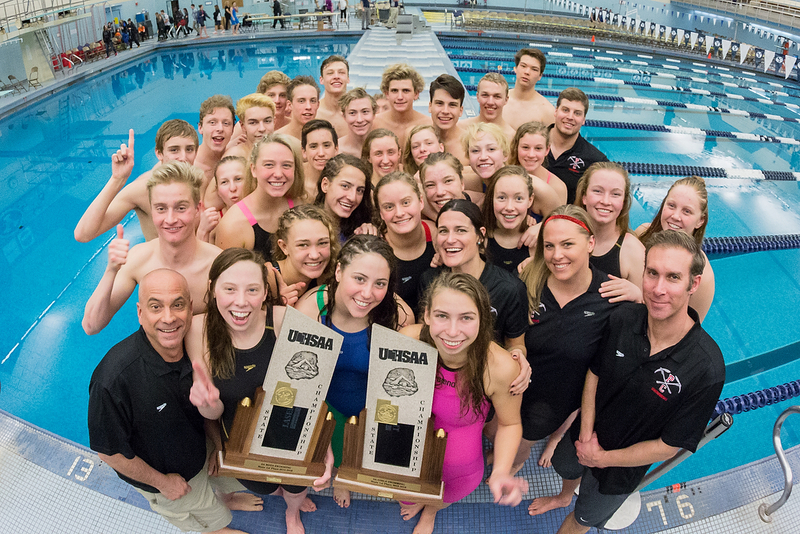 The Park City High School swim teams celebrate with their trophies after winning their third-straight 3A state titles. 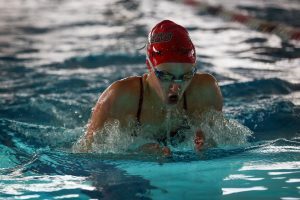 Going into the 3A state championship meet at Brigham Young University in Provo over the weekend, it was essentially a foregone conclusion that the Park City High School boys’ and girls’ swim teams would claim their third-straight state titles. Both squads had been dominant all year, frequently defeating schools at the 4A and 5A levels. But that didn’t mean the Miners couldn’t provide plenty of entertainment at the meet. En route to dominant victories in both the boys’ and girls’ meets, the Miners won 17 of 22 events and broke six 3A records. The biggest record to fall over the weekend was in the 200-yard freestyle race, where Lucas Hess’s time of 1 minute, 41.89 seconds bested a time set in 1977. 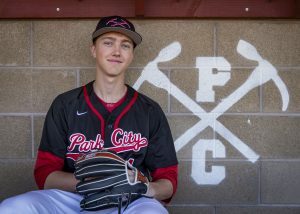 The Park City sophomore earned the boys’ Co-Swimmer of the Year award for his efforts. Hess also earned a gold medal in the 100-yard butterfly event. PCHS senior Jinwon Bailar already held the state record for the 100-yard backstroke, but managed to break his own record Saturday, completing the race in only 51.32 seconds. Bailar also won the 200 individual medley. The Park City boys dominated in the relay events, winning all three team races and setting a state record in the 200 free relay. In the 200 medley relay, Cole Peterson, Bailar, Dennis Djunic and Jack McMullin finished less than four-tenths of a second ahead of Cedar to claim first place. In the 200 freestyle relay, Vincent Hess, Lucas Hess, Alex Yokubison and Bailar finished nearly three seconds ahead of second-place Canyon View. Finally, in the 400 freestyle relay featuring Vincent and Lucas Hess, Peterson and Yokubison, the Miners won by nearly seven seconds. But, as strong as the boys’ relay teams were, the PCHS girls’ relay squads were even stronger, stealing the show in Provo by not only winning each of the three relays, but setting 3A records in each in the process. In the 200 medley relay, Mara Selznick, Joelle Hess, Kendal House and Katie Hale finished in 1:47.83 to defeat second-place Cedar (1:50.08). In the 200 free relay, Siena Senn, Elise Beller, Hale and Rozie Selznick narrowly defeated Cedar, 1:38.18 to 1:30.70. Finally, in the 400 free relay, Senn, Beller, Mara Selznick and Rozie Selznick finished in 3:35.57, nearly 12 seconds ahead of the Cedar squad. 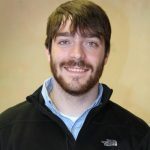 By virtue of being a member of two winning relay teams and also winning the 200 freestyle and 500 freestyle races, Senn was named Swimmer of the Year. Park City Coach Kelly O’Brien, who won Coach of the Year honors, said she was proud of the strong sophomore swimmers. "Nobody comes close to being more deserving," she said. "I’m happy with how it turned out for the team." Other Park City champions included Cole Peterson in the 500 free, Joelle Hess in the 100 breaststroke, Mara Selznick in the 100 backstroke and Rozie Selznick in the 50 and 100 freestyle races. O’Brien said it was clear that the Miners’ training paid off in a big way at BYU. "They put in the work the past five months," she said. 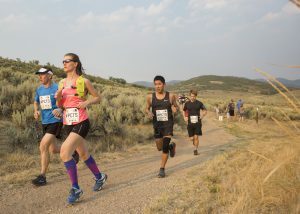 "When it was finally time to pay attention to detail and get some rest, the taper hit right on the dot. Obviously the relays were very exciting, but everybody had a best time. From the freshmen to the seniors, everybody dropped time. That was exciting." 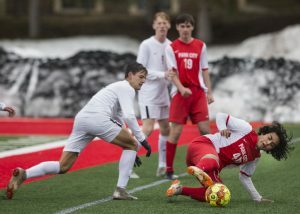 Looking back at her first season as Park City’s head coach, O’Brien said she learned some valuable lessons that she’ll take into the future. "It was nice for them to take the ideas of the all-new coaching staff," she said. "Even the elite swimmers could take what they already knew and build on that. During the season, it was always nerve-wracking for me to train them hard. I had to trust my gut and hope that would pay off, but the results showed at the end of the season. From now on, I’m going to push them a little harder than they like at the beginning of the season with the confidence that it’ll pay off at the end of the year." Though the Miners will lose some key seniors entering next season, O’Brien said she believes Park City will be back atop the podium in 2017. "I see us continuing to grow," she said. "We’ll continue on with what we’ve got and continue to challenge ourselves."